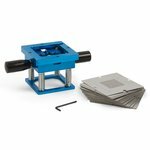 Multi-functional BGA reballing kit with a convenient station for holding stencils with with height adjustment and a set of 56 BGA stencils. 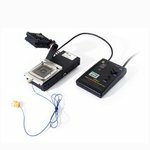 BGA reballing kit contains a reballing station and a set of stencils (0.8 mm, 0.76 mm, 0.6 mm, 0.5 mm, 0.45 mm). Re-balling base, 2 mm Allen key, mini spatula, 10 g solder paste, 3 stencils and user's guide. 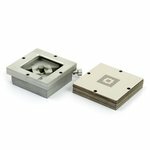 Bokar XURB-S set has an independent heating system, a Hot Plate XURB-H matching the reballing fixture. 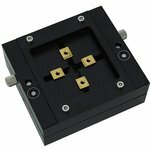 This heating method allows for reflow of reballed IC in approximately 2 minutes, which is 2 to 3 times faster and better than on any other heating system. 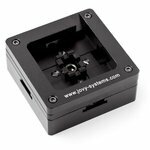 Jovy Systems JV-RKX reballing kit for XBox 360 repair. Kit includes X02047-012, GPU, CPU, HYB18HS12321AF-13 BGA stencils and Jovy Systems JV-JIG BGA reballing stand.